We also serve Wisconsin, including Milwaukee, Oak Creek, Franklin, Racine, Brookfield, New Berlin, Franklin, Union Grove, Burlington and Kenosha, Cook County, Dupage . We will travel anywhere in the USA. 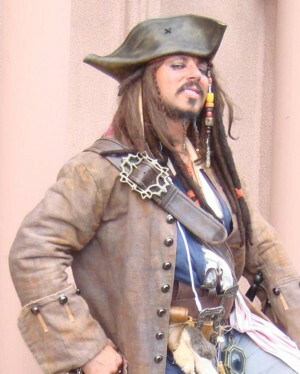 Let Captain Jack Sparrow* entertain your kids and guests at a birthday party, pirate party or special corporate event in Chicago and the surrounding area in Illinois. 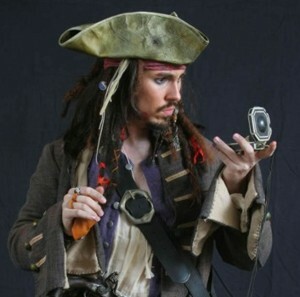 For the ultimate pirate party or an unforgettable event, hire a professional Captain Jack Sparrow impersonator entertainer for your very special occasion. Jack is always a hit at every event he appears. All of our Jack Sparrow impersonators are experienced actors and entertainers and will bring the captain alive at your event. 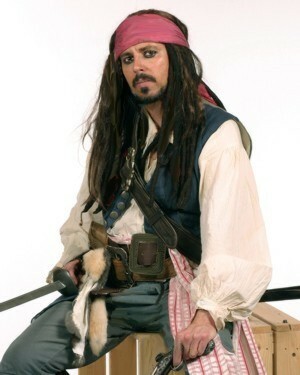 Adults and kids of all ages love Jack Sparrow and interacting with him in various piratical activities. Call Jack for a fun children's birthday party or any kind of party or corporate event in Chicago. Two Jack Sparrow* pirate entertainers for hire in Chicago Illinois.